"These flavorful waffles are filling, lightly spiced, slightly sweet, and perfect for the holidays. They can easily be made using leftover sweet potato casserole and cranberry sauce after Thanksgiving or for a festive Christmas morning breakfast!" Stir sweet potato, milk, egg, and butter together in a bowl. Whisk flour, brown sugar, baking powder, 1 teaspoon cinnamon, nutmeg, ginger, cloves, and salt together in a separate large bowl. Add potato mixture to flour mixture; stir until batter is just combined. Ladle batter into the preheated waffle iron and cook until waffles are golden and crisp, about 3 minutes. Stir maple syrup, cranberry sauce, and 1/2 teaspoon cinnamon together in a saucepan over medium heat. Cook, stirring occasionally, until well-combined and heated through, 5 to 10 minutes. Pour syrup over cooked waffles. 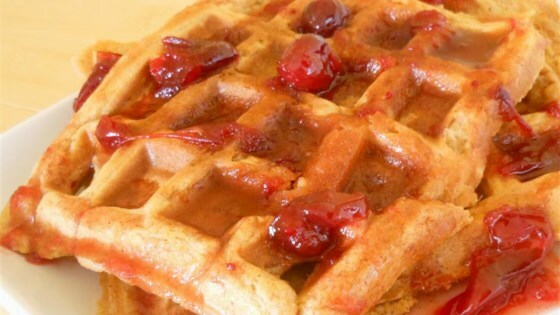 These waffles are oh so yummy, and the Cranberry Maple Syrup is the perfect accompaniment. Thanks for sharing.